THE online show for acoustic guitarists is back! On Wed 25th and Thurs 26th June, 2014, the MusicRadar Acoustic Expo will return for its second year. Running in association with Total Guitar, Guitarist, and Guitar Techniques magazines, Acoustic Expo 2014 will be your ticket to two days of free, top quality acoustic guitar video lessons sponsored by Lowden, plus artist features and video demos of must-have gear. More details will be revealed about this show over the coming weeks, but you can expect to see interviews and features with world class acoustic artists such as Ray Lamontagne, Ben Howard, Ed Sheeran, Andy McKee, Jon Gomm, Newton Faulkner, Rodrigo Y Gabriela, Frank Turner and more. 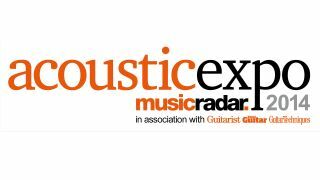 Acoustic Expo 2014 runs from Wed 25th to Thurs 26th June, right here on MusicRadar.